It seems the movie “The Bucket List” has made its way to the fishing world here in Hollywood and Fort Lauderdale. 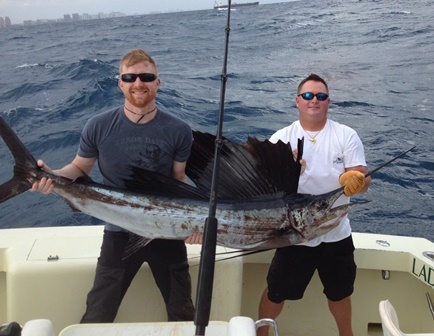 We get many requests now for certain kinds of fish and today, with previous guests Jeff and his son Joel, the request was for a Sailfish. I personally didn’t think Jeff was old enough to have a bucket list but none the less the customer is always right. On previous trips, they had always shared the charter with others but today, just in case the right fish came along, there would be no sharing and the fish would be theirs, providing he graced us with his presence. So off we went with but one prey in mind, an Atlantic Sailfish. Grey skies and a bit of chop on the seas were our conditions as we deployed the kites and waited. Lately, small Silky Sharks have been around in numbers. These fish are fun to catch but we’d rather they not eat our “live baits”. They are quick predators and there is no stopping them once they have the bait in their sights. Joel was called upon to deal with these as Jeff saved his strength for “the right fish”. A rod and reel began singing out and since all we’d seen was the small sharks, Joel was in the chair doing the fighting. This time however, the fish we’d hook was a Sail! He let his presence be known by the jumping, twisting and everything else he could do to escape. And it was a quite a show as the fish easily tore the line off the spool. Joel tired quickly after dealing with the small sharks and now Jeff was in the seat and had his first feel of what his bucket list item felt like. Rod bent, instructions given, he did an excellent job angling the fish closer to the boat, only to watch the fish easily swim away taking the precious line that had taken more than 20 minutes to retrieve. This fish was not quite ready to come to the boat. Now, just a note… It is common practice that when you hook a fish as we did, you leave the kites and other baits out, so essentially, we’re still fishing. And it just so happened that another, smaller Sailfish had eaten a bait and was now jumping out behind us. This can make things complicated as you do NOT want these 2 fish next to the boat at the same time. So we loosened the drag on Joel’s fish and just let him take all the line he wanted while we dealt with Jeff’s Sail. And so it was, we boated Jeff’s fish first for pictures, measurements and releasing the fish. We then released Joel’s fish boat side when he finally retrieved all that line and amazingly, our time was up and headed home. For whatever reason, Joel is featured in the picture with JJ. I guess Jeff was too spent. It doesn’t always go this way but today it had. After 4 trips with us Jeff finally had his Sail, something we had apparently instilled in his mind by mentioning that Sailfish season begins in November. I found they planned their entire trip around this fishing expedition. I might also add… They loved our new home here in Hollywood, Florida. I’m sure we’ll see them again soon. Our recent move from Fort Lauderdale to Hollywood still has us operating out of the same port and fishing the same areas. And writing this fishing report is especially fun as we’ve had some exceptional fishing this week. 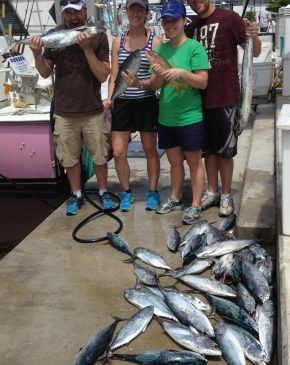 Nice sized Blackfin Tuna have also been in our area and around where we’ve been catching the Dolphin. Some of these are very small but most have been decent size, around the size of footballs or a little bigger. Skipjack Tuna have been mixed in with them and a few Bonitos as well. It makes for a nice mix in the fishbox. November is a time of change as the weather cools and we don’t like to limit ourselves by just trolling. Live bait and flying fishing kites can be very productive as the Sailfish begin to make an appearance. But today we caught something a bit different on our kite baits. A big swirl and a black back came across the surface and we truly had no idea what had taken the bait. 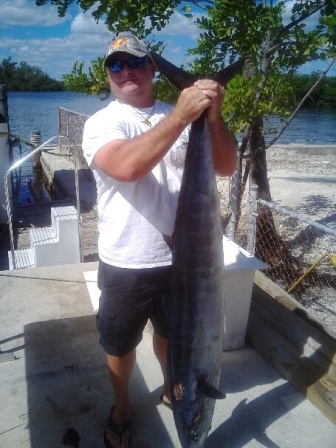 We needed 2 anglers and almost 30 minutes to land this Wahoo JJ is holding which weight about 60 lbs. It’s not often you can hook a Wahoo in the kite, even with a wire leader, as their teeth are very sharp and their extreme speed makes escape quite easy. We were delighted with our prize. 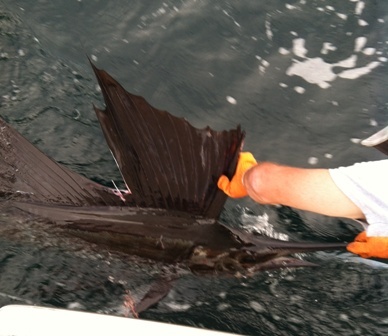 Sailfish will be coming soon so keep an eye out for our fishing reports from Hollywood and Fort Lauderdale. It’s all just off shore and it’s a blast! One of my first trips from our new dock in Hollywood, Florida was not exactly the perfect south Florida day and my fishing report is about this trip. Doctor Dale and his crew showed up in windy conditions, overcast skies and a 60% chance of rain for their all day trip. The seas were running about 4’ and that was about his threshold so across the street we went to take a look. They had driven quite a distance to go fishing that day and the waves breaking on the beach were around 4’ so they opted to go rather than postpone. It turned out to be a good choice too. Again we reset and had to wait. That’s the part of fishing that sometimes get to you. With doc up and ready, our next bite was seen coming for the… you guessed it, long right kite bait. A Dolphin was approaching and quite excited about his next meal. This fish took some time to land as the big ones can be especially acrobatic and are not happy when they get close to the boat. Darren finally was able to stretch out and gaff this 20 pounder which was immediately put in the fishbox and the lid slammed. They have a tendency to jump back out of the boat and it would be a shame to loose such a prize. Ok, this long right stuff is getting old, right? But we’re not done yet… Some more waiting and here’s comes Mr. Sailfish. He’s on and jumping and Rick, who caught the Barracuda, is now battling his first ever Sail! Doc and Darren are down there coaching and I’m just trying to keep the boat close to the fish as we land and photograph this delightful fish before releasing him back to the sea. It took a bit of reviving by dragging him slowly by the boat in the water until he regained his strength. We really try to do what we can for successful releases to protect our fishery. Doc was up for this battle as he had never caught a Shark before and on a class 80# rod and a Penn International 130, he actually made fairly quick work of this fish. About a 7’ Hammerhead had eaten our bait but luckily he never sounded to the bottom. He stayed up near the surface making the fight much shorter and within about 20 minutes, we had him to the boat but couldn’t hang on. He screamed out some more line but returned to us shortly to be captured, pictures taken boatside and released. And with that? Our day was done and it was time to head home. P.S. It wasn’t until I sent the picture from my phone to the computer that I just remembered our 4th passenger. That would be the dog by the bottom of the fish. This truly was a sea dog too. 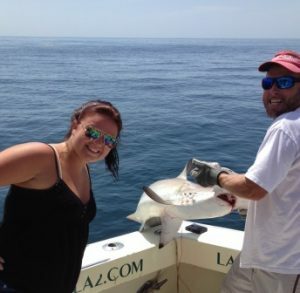 This fishing report, for the southeast of Florida and the Fort Lauderdale area, is by Fanntastic Fishing, an upscale charter fishing service. As we enter October, we have already experienced our first cold front taking temperatures to a brisk 71 degrees. While this may seem like a small thing to you, especially if you live up north, down here this slight drop can mean all kinds of good news for the fishing. With this kind of drop, the Mullet and other baitfish are moving south as the sea water temperatures cool. The other day in very close to shore, Mahi-mahi were seen chasing Ballyhoo in only 11’ of water. You could almost cast to them from shore. While the Dolphin fishing has been on the rise, the Kingfish and Bonito are slowing down some. The Bonito will mostly vacate the area except for the rare few soon and the Kings come and go. Right now has been in a lull period partially due to the full moon we’re experiencing. But trolling is still in the cards. October is an excellent time for the small Sailfish to make their appearance before the larger fish get here in November and later winter. Fishing live bait will soon be replacing trolling for the Sails, Wahoo and Tuna that come. The big Kings are also not far behind. While this is mostly surface action, this time of year is when we turn to bottom fishing for Snapper, Grouper, Amberjack and more. The Amberjack in this picture gave George quite the fight, a 20 minute battle of tugging on both ends. Cooler weather, winds from the northeast, ocean waters cooling? All great signs of changing conditions for fishing here off Fort Lauderdale. If you’ll be in town for the International Boat Show at Bahia Mar, you might want to take half a day or so and give fishing a try. It’s a blast! Most fishing trips on charter boats here in Fort Lauderdale are limited to 6 passengers. 6 is the maximum we can carry at one time but on occasion, 6 people aren’t wanted or needed. Sometimes it’s just 1 person on board with the captain and first mate. And today, we had Bill. Now having just 1 person on board is kind of a treat for the crew. We have to learn just one name, there’s never a question of who will fight the fish and so on. Fishing lately has been fairly active on the reef area. Some Bonitos are still around and our first bite turned out to be quite a test for Bill and his new shoulder. Just 2 lines out and the deep one went off. A BIG run taking drag as we moved the rod to the chair and Bill took over. With a run like that? It must be a Wahoo! After about 10 minutes we found it could also be a foul hooked Bonito, a big one, but a Bonito none the less. While Justin and I were kind of disappointed, Bill seemed quite happy with his first fish of the day. One fish that has been consistent lately has been Kingfish. Most have been between 5 and 8 lbs. and the bite has been good. We began catching these and I think Bill might have thought about maybe having one more person on board to help. You see, even when we have just 1 on board, we fish just like we do with 3, 5 or 6 people. Our two deep rods were going off often and many times Bill would finish with one only to have another put in his grasp. His rotator cuff surgery was holding up well. With the Kingfish action so good, we stayed with them and caught our limit and then some. Finally we opted to try for something bigger and began heading to deeper waters for a shark or Grouper… Time to give Bill a little rest. But Mother Ocean decided Bill needed one more challenge and one of the top baits got hit with another big run. Once again Justin and I surmised that another large Bonito had struck and we were preparing things as Bill fought his fish. After almost 10 minutes into the battle, what we thought was a Bonito jumped and showed his true colors. A Sailfish? In September? 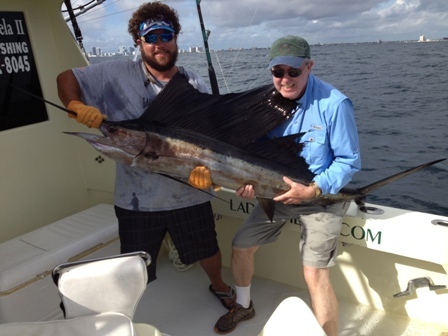 The absolute worst month to catch a Sailfish off Fort Lauderdale? Seeing what was on the line kind of changed our attitudes a bit as we went into sportfishing gear clearing lines and moving the boat backwards to aid Bill in his quest. The Sailfish we do catch in October are usually small but this fish was full grown and angry. Even after 30 minutes, he managed to jump close to the boat and completely clear the water. Another 10 minutes and we had him boatside for billing, pictures and his release. It took a bit to revive the fish after the long battle but he swam away in excellent form. While the sport of fishing here in Fort Lauderdale is a year round thing, certain times of the year cause an excellent result in how good the fishing is and what we catch. As the sun begins to move to the south and the days are shorter, the water temps begin to fall. The cooling water is usually first shown by schools of Mullet traveling south along our beaches and through the waterways. This is already beginning here in Fort Lauderdale. While Mullet are easily seen, even by novices, other baitfish are also moving south and with them they bring the fish. Always on the prowl for food, schools of Bonito, Kingfish, Mahi-mahi, Barracuda and Sharks follow these schools of bait right past our shore and it’s just starting to happen here. Our trip yesterday was the kind of trip that the need for talking wasn’t needed. There was so much action and so many fish, our poor customers barely had time to catch their breath. In just over 2 hours of fishing, we caught over 40 Bonitos and 2 Kings. It was over an hour before we were able to get ALL our lines set, as each time we started putting something out, it got hit. The one time we did have everything out at once, all lines came down with fish on them. The group was having a blast and Justin was delighted with the help he got from all involved. The guys were bringing in the shock cords and boating the fish while Justin rigged and set lines. This is the time of year when most our action is close to shore by these schools of migrating bait. Small Mahi-mahi are beginning to show and fishing for their big brothers and sisters has been excellent in the fall the last few years. We expect the same this year as well. Upon my return to Fort Lauderdale from the Bahamas, my first fishing trip back got even me excited! Our trip today was a mixed group of people and of course, they ALL wanted to catch fish. Trolling had been producing some small sized Bonitos on the reef and with little wind, we decided to keep the boat moving in our high 80’s temps and begin out day with some easy fish to catch. The Bonitos were biting pretty good as were the King Mackerel. It took a little over an hour to catch everyone aboard a couple of fish. Bending the rod is always our goal and the reef was providing this with no problem. But as usual, things tend to slow a bit as the sun gets high and the waters warm. We’re not really in a season where sharks are plentiful but you never know what will happen when you deploy large baits. Grouper, Amberjack, even Sailfish and Swordfish can find these baits. And of course, any kind of shark. We set a top bait and then began dropping a bottom bait. It didn’t get far before Justin let me know we had a bite on the drop. 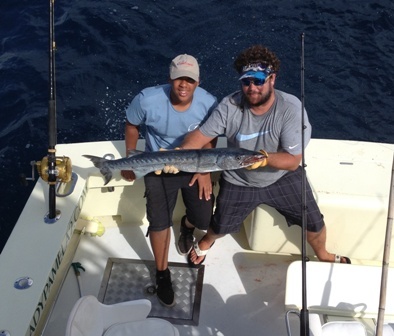 With young Robert in the chair, we hooked and caught a large Barracuda. At just under 4’, I’m afraid he was no match for the heavy gear we use when we fish for “the BIG stuff” and was easily caught and released. Another bottom bait was rigged and sent down to the bottom with no interruption this time. The thing about this kind of fishing is waiting for the bite. The scent travels with the current, which there was plenty of today, and anything swimming through that water column will track the scent back to the bait. Our enemy in this kind of fishing is time, the longer we do it, the better our chances but time was running out. As I called for lines up and Justin began cranking the bottom rod about half way up he yelled he’d had another bite. This time it was no Barracuda that bit, if it was, it was a huge one. The rod bent, some drag took off and Anthony was in the chair for the fight. It took about 10 minutes to land his Mako Shark, very aggressive and somewhat angry at the boat. I can only guess he was somewhere around 70 to 80 pounds and maybe 6’ long. While I kept the fish tight as Justin hung on, the group was taking pictures before we released him back to the sea to get bigger. While not a huge fish, very exciting as we don’t catch many of these sharks here in the warm waters off Fort Lauderdale. I’m afraid I never got a picture of this fish and my requests to be sent the ones the guests had fell on deaf ears. So Robert’s Barracuda will have to do. But the thrill is still with me upon my return to fishing at Fanntastic Fishing here in Fort Lauderdale where you just never know what will bite. Keep em tight… Keep em on. 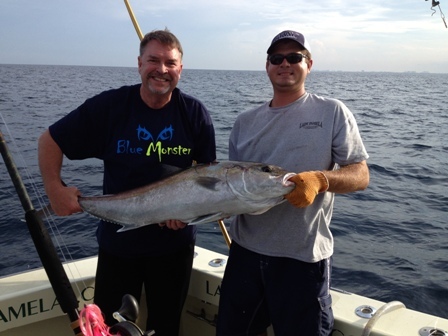 Fort Lauderdale fishing has been fairly consistent lately. Trolling the reef area has been producing Bonitos, a much sought after bait fish, in some good numbers. These fish are false Tuna’s, also known as Little Tunnys. Their edibility is poor because of the dark red meat and strong fishy taste but they supply us with strip baits after we thin out the meat on the skin and cut them to shape. These baits provide us with most our trolling baits. With Anita, her son Christian and his girlfriend Megan, Megan’s brother Dillan and his girlfriend Chelsea (I think I got that all right… LOL), we were on our way for some fishing fun for a few hours. Seas were calm and the skies clear to allow our summer sun through today. Folks, I’m telling you, it’s hot! No wind in the early hours of the morning and lake like conditions as far as waves. Our first bite was a small Kingfish and as we circled around we found no more Kings but the Bonitos were biting pretty good. Anita just watched from the bridge as Christian and Dillon caught fish, while the girls were struggling to land one, they each lost a fish. Megan was taking it personally, Chelsea didn’t seem to care. But after some time and coaching from the now expert boyfriends, all had caught a few fish and we decided to try for something bigger. Just 1.5 miles from shore in 300’ of water, we deployed our baits and waited. With no breeze from the boat moving on the troll, it became quite warm. Anita retreated to the deck for some sun while others ran to the AC in the cabin. We had waited over an hour and no bite had come. It was time to go home and we were bringing in the baits. Out time was up and I was disappointed but… the surface bait came down. We could see the balloon we use for a bobber bouncing on the surface and when it finally began to run out line, we set the hook and came tight with a Hammerhead shark. We headed home all happy and smiles as the moving boat had refreshed the breeze. Thes folks from Kentucky had a blast! There aren’t many places in the world where just 20 minutes or so from the dock you are wetting lines and fishing in the deep sea. Fort Lauderdale happens to be one of them and since so many people visit us here, it makes this fun and exciting sport very accessible. Bernie and his son, Nicky, showed up right on time for the afternoon trip. What was supposed to be a shared fishing trip turned out to be a private charter and with just the two of them on board, we were off. The afternoon trip can start off slow, with the heat of the day making the deeper baits the most hit. Very little surface action until that sun gets down a bit. We trolled and picked at some Kingfish and a Bonito or two before trying for something larger. You just never know how things will go. We set a few deep baits for big fish like shark, Grouper, Snapper, whatever might be around. After all, that IS the thrill of it all, catching something big. We were also positioned close to a shallow wreck in about 150’ of water and were dropping some small baits for any Snapper that might be lurking. A rigger line came down and a Sailfish began jumping. He had eaten one of the Pilchards and we had him on 20# test line. 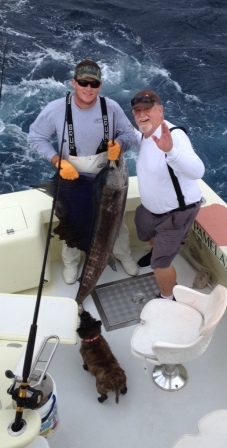 The spinning rods are great for catching Sailfish… It’s just that they don’t hold a ton of line. We have to retrieve everything to go after this fish before he spools us. It was quite an acrobatic fish for sure… Jumping, running out the line, we were down to maybe 1/3 a spool left before we finally began backing down on this fish. Even as we got close, this fish was still jumping and taking drag, putting on quite the show. 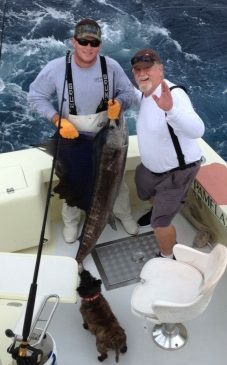 After 30 minutes or so, we finally had him at the side of the boat and Nick had his first ever Sailfish! Not a bad way to end our trip and remember, this is just a little over 1 mile from shore. 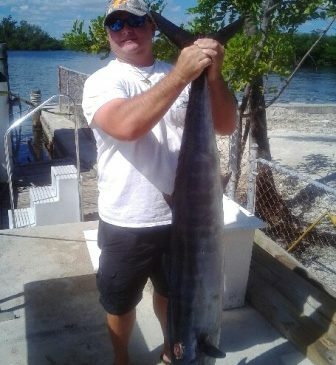 While we don’t always catch “The BIG one”, Fort Lauderdale fishing can certainly be exciting either way. Keep em tight… Keep em on! 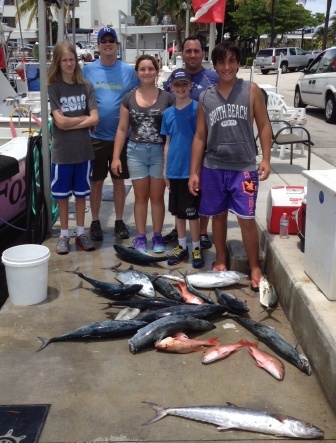 Just another typical day here in south Florida as dad Joe, with his two kids, Spencer and Christian, and dad Michael with Megan and Brice showed up ready to go fishing. Fort Lauderdale has been fairly consistent in both weather and fishing as of late. Calm seas and light breezes in the mornings make for almost lake conditions as we headed out to see what could be done to keep this crew occupied. One thing about kids, they like action and today the Bonitos were cooperating. One rod, then another would sing out, the kids grabbing rods in their turn which had been pre-determined. Megan went first and they kind of rotated after that. I honestly lost count of the Bonitos we caught, a few Kingfish mixed in for good measure but we had a blast putting them in the box. Well, both dad’s had been kind of slighted to this point so Adam rigged a shark bait and we stuck it out there hoping for something big. Shark, Grouper, whatever came along. As always, while we wait, we might as well fish, right? So we set the kids up with some bottom gear to see if any Snappers were around. Our first two bites were Triggerfish, not exactly the targeted species. But the kids got better with the rods and soon we were catching Mutton Snappers. But we had plenty of action and lots of family fun here in Fort Lauderdale. 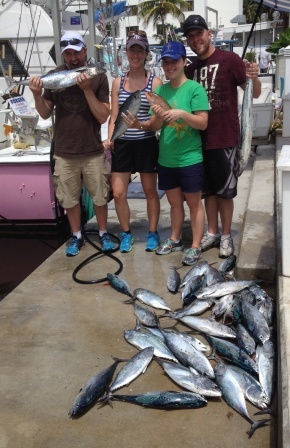 And a pile of fish for this stellar crew.